431 N. 5th St. Photo by Jeramey Jannene. 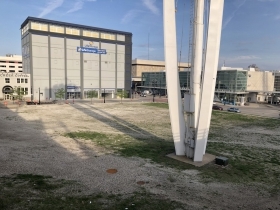 A long-vacant site across the street from the Milwaukee Intermodal Station will soon hit the market. 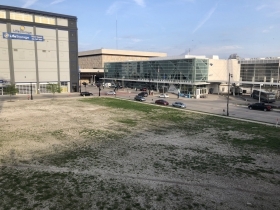 A file is pending before the Milwaukee Common Council that would allow the city to market their portion of the lot at 431 N. 5th St. alongside the Wisconsin Department of Transportation portion. The parties would jointly market the approximately one-acre site for up to one year. 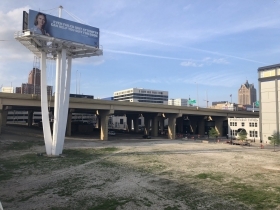 The lot is most recognizable for what rises high above it, a large, three-sided billboard owned by Clear Channel Outdoor. Any future development would have to accommodate the sign, which is highly visible from Interstate 794, because of a long-term lease between WisDOT and Clear Channel. 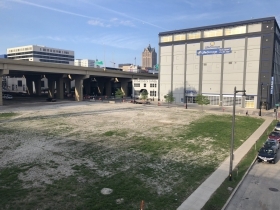 Alderman Robert Bauman told Urban Milwaukee he is looking for a development that takes advantage of the site’s location near the train and bus station, as well as the soon-to-open streetcar line. He says the city has already rejected proposals for self-storage facilities on the site. The city’s 2010 downtown plan envisioned a parking garage on the site as part of a larger redevelopment of the area. Historically, the site has housed a number of industrial or warehouse uses. WisDOT acquired the site in 2004 for $2.3 million, demolishing the buildings on site, as part of the Marquette Interchange project. City records indicate the complex of buildings formerly on the site dated back to at least 1915, originally built for a predecessor of the Palmolive Company. An industrial skywalk connected the four-story-tall complex to the warehouse still standing across the street and was used by the soon-to-be-defunct Boston Store when the company owned both buildings. The complex was owned by Allied Glove when WisDOT acquired it for the massive highway project. 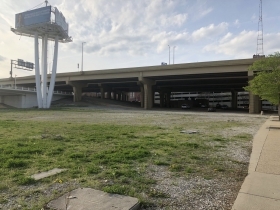 The land was included in a proposed on-and-off ramp connecting to Plankinton Ave. as Bruce Murphy reported for Milwaukee World in 2001, but the proposal was rejected. The building across N. 5th St. that was formerly connected via a skywalk is now being used for just the thing Bauman doesn’t want, personal self-storage. 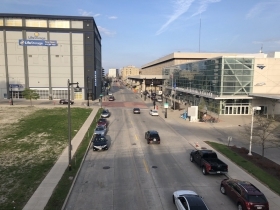 The property moving from tax-exempt public ownership to private ownership would be a major boost to a struggling tax-incremental financing district that provided $6 million for the conversion of the former Milwaukee Road depot into the Milwaukee Intermodal Station in 2005. The district was well behind in recovering its costs from incremental property tax revenue before the city shifted funds from the massively overperforming Beerline B TIF district. The station district is approximately $20 million behind its anticipated property value growth, owing in large part to the inability of the private station operator to lease out office space in the building and the lack of ancillary development around the train station. The area isn’t likely to remain dormant much longer though. The Hop, the city’s streetcar starter system, is on schedule to begin operating and connect to the train station later this year. And a major redevelopment plan for the United States Postal Service complex at 345 W. St. Paul Ave. is pending, contingent in large part on whether USPS decides to execute lease extensions. Chicago-based R2 Companies acquired the site for $13.1 million in 2015. There has to be a way to get the post office out of there. The operation in that massive monolith can’t be very efficient and the main post office surely belongs by the airport. Where’s the leadership? A parking structure! Really, is that the best use? Maybe a structure with mixed-use incorporated, first floor retail to serve the 1000s of passengers coming through the Intermodal Station and parking and housing above. The last thing downtown needs is yet another parking structure that adds to the dead zone effect. Yeah, that self-storage facility across from the Intermodal Station pisses me off every time I see it. Whenever I arrive from Chicago, I always stare and that wall and dream about a large mural or light display. Milwaukee is developing a reputation for its murals! The city plan for the area was hoping for much more–retail, housing, transit oriented. I’ve seem conceptual drawings that show a large overhang over St. Paul, which would certainly help with departing and arriving passengers in inclement weather. Almost something that mimics the train shed, but outside, for cars, buses, bikes, people. It would also really help to define the space as a “station district”. At this point, I think residential with a degree of street-level retail makes sense. (However, I don’t think the area in its current manifestation will accommodate a heck of a lot of retail at this point. Perhaps some loft-style, open concept work space, shareable work space, etc. Dry cleaners, Amazon.com delivery space, a bar and restaurant. A decent convenience store that sells what leisure and business travelers forget. Why did they tear down the building that was there? The historical website’s photo shows that it was renovated, presumably sometime in the 80s or 90s. Was it speculation for the ramp? What a miserable decision. There’s enough pieces to make a pretty decent neighborhood around the train station. 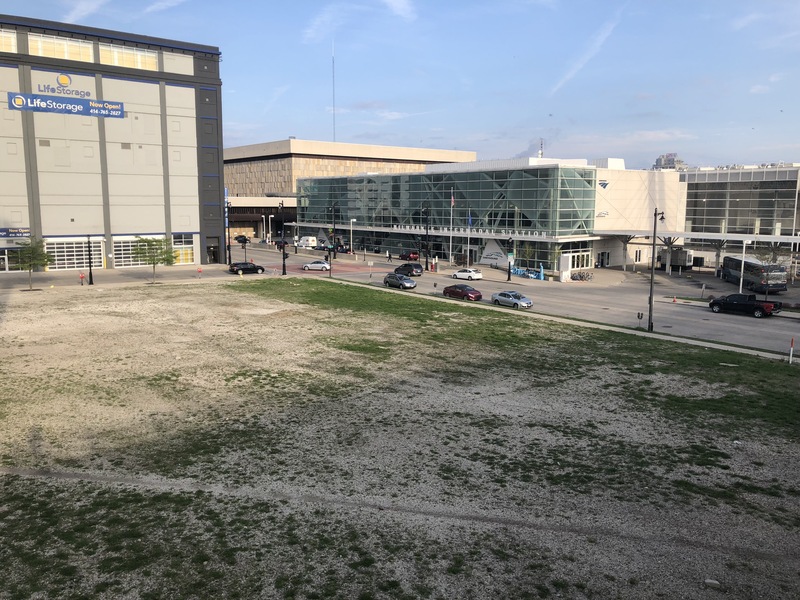 The dead weight is the vacant lot on 5th(article), the surface parking lot at our streetcar terminus on 4th & St. Paul, USPS’s MKE river front parking lot, MMSD’s 1 story menonomee riverfront HQ & parking lot, the underutilized buildings on 2nd. A massive redevelopment at USPS would be great, but the pieces are there without it. Mike, what do you mean, “MMSD’s 1 story menomonee riverfront HQ & parking lot?” The MMSD that I’m aware of has no 1 story HQ. Good lord. A parking garage??? And why must that dreadful billboard stay?